Energy Dynamics: What Does 100% Renewable Mean? 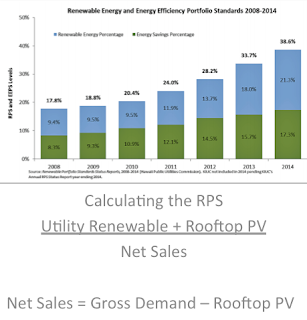 I have a strong point of view (see my RPS post) that Hawaii’s Renewable Portfolio Standard (RPS) should be pragmatic and practical, not one based in aspiration. The RPS initial purpose was to set a market floor for renewable energy development at a time when renewable resources could not compete cost-wise with fossil fuels. However, recently, as renewable technologies mature and have become more cost-competitive and established, the challenge has been how to develop a diverse portfolio of resources and technologies by encouraging prudent investments and optimization of all assets (whether utility or customer owned) that will result in a more affordable, cleaner, efficient, and reliable electrical system that will benefit all electricity customers. 100% renewable is an easy soundbite, its implementation is not. Yesterday someone asked me to define "100% renewable." It was a good exercise for me to really think about language we use to communicate and how it can be translated and received differently depending on one's knowledge and interest. I believe there are three ways to define 100% renewable - literal, pragmatic or as an inspiration (not aspiration). If we are to define 100% renewable literally, it just means that 100% of our electricity needs will be generated from renewable resources. It does not acknowledge that the generation of electricity is just one part of a larger, complex system, nor does it acknowledge the cost, equity and accessibility issues. The electricity system is an equation governed by physics and economics. 100% renewable literally only addresses one part on one side of the equation. Defining 100% renewable through a pragmatic lens helps us to take a systems approach to reach that goal by assessing all parts of the energy system that will lay the foundation to move towards a 100% renewable goal cost-effectively and methodically to reduce risk to improve our chances for a successful transformation. Through this lens we begin to understand the paradigm shift required. For example, as we move further away from the traditional central power design to integrating more renewable resources (both utility and customer sited systems), the utility model shifts from generating electricity for supply to satisfy demand to incentivizing the use of electricity to when the cleaner and cheaper resources are most abundant - that is, shifting demand to when the sun is shining and the wind is blowing. This paradigm shift also recognizes the utility as the aggregator of data - that is, the analysis and management of data for the efficient delivery and usage of the cleanest and cheapest electrons while maintaining power quality and stability of the grid. When one defines 100% renewable as an inspiration, it requires us to think about energy differently, to redesign how we live and do business more efficiently and sustainably to achieve that goal. I chose inspiration over aspiration because to inspire connotes instigation and innovation, whereas aspire just means hope and dreams to me. We must be inspired to do and implement, not just talk and dream. Unless there are major technical and cost breakthroughs in the near future, 100% renewable is a journey that many of us will not see accomplished in our lifetime. However, we can lay a solid foundation for the next generation by combining pragmatism and inspiration to articulate Hawaii's 100% renewable target. Failure is not an option in this endeavor. Because of the significant infrastructure investments that need to be made, Hawaii has only one chance to get it right or it’s going to be a very expensive energy transformation done on the backs of those who can least afford it. Yes, Hawaii's Governor has a bully pulpit and a very important role to articulate and inspire Hawaii's energy future but his recent linear description and pronouncement is just not a complete picture. 100% should not be a target that results in higher costs and reduced reliability. We need a source of firm and dispatchable energy and while I support biofuels, do we really have the resources to produce an economic locally produced fuel? And is it at the price of locally grown food sources? Sustainability requires a balance and the food vs fuel discussion must be considered.